Make quick use of leftover watermelon and mix up a super fresh, very delicious watermelon beer. It's a variation on the popular shandy and, with just three ingredients, it mixes up in minutes. The watermelon beer recipe pairs freshly muddled chunks of the summertime fruit with vanilla syrup. It's a perfect combination that's just waiting for your favorite wheat beer (one of the best styles for any shandy). 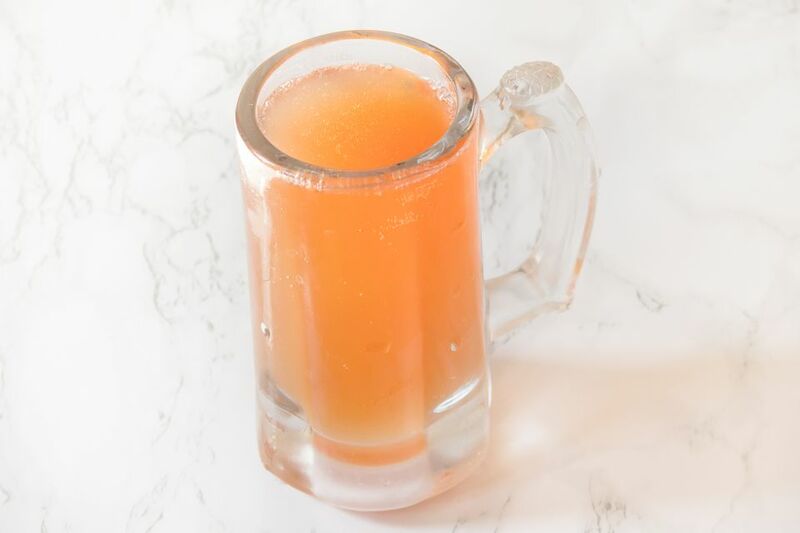 The taste is crisp, fruity, and slightly sweet, creating one of the most refreshing beer drinks you'll enjoy all summer. In a mixing glass, muddle the watermelon to extract its juice. Strain out the fruit pieces and any seeds, leaving only the juice. Pour the vanilla syrup into a frosty pint glass, then fill halfway with watermelon juice. When straining the watermelon, you can get a little extra juice by pressing the fruit into the strainer. Be sure to use a fine-mesh strainer to capture all the seeds and small pieces of fruit. If you have a juicer, use that for the watermelon to maximize the juice yield. Store any excess in a tightly sealed bottle in the refrigerator and use it within a couple of days. You can find vanilla syrup at most grocery stores because it's a popular flavor for sweetening coffee. Vanilla syrup is also very easy to make at home. All you need is 2 cups of sugar, 1 cup of water, and a vanilla bean. Stir the sugar into boiling water, reduce the heat, cover, and simmer for 15 minutes. Pour the syrup over a split vanilla bean in a heatproof jar. Let it steep for about 8 hours before removing the bean and bottling the syrup. It's even easier (and cheaper) with 1 teaspoon of vanilla extract added to the hot syrup. Watermelon beer can be made in any tall glass, no matter the volume. The point is to fill the glass half-way with the juice and syrup mix then fill it the rest of the way with beer. You can certainly add ice if you like. It's not necessary if you use a chilled glass and ice-cold beer, though. Make a pitcher of watermelon beer for a cookout or pool party. Increase the ingredients to fill your pitcher or for the number of servings needed. If you want to make it ahead of time, combine the watermelon juice and syrup. Hold the beer until it's time to serve. Use plain simple syrup or agave nectar if you prefer. Basil or mint simple syrups would also be nice complements to the watermelon. Add other melons to the muddle or try this beer recipe with honeydew or cantaloupe alone. Give the watermelon beer a nice kick by adding a shot (1 1/2 ounces) of rum or tequila. How Strong Is a Watermelon Beer? Watermelon beer is a relaxing, low-proof drink. Basically, it will be half the strength of your beer. For example, pouring a wheat beer that has 5.5 percent ABV will result in a watermelon beer that's just 2.75 percent ABV. Add a shot of rum to that and its alcohol content will be slightly less than the beer (5 percent ABV).